I first saw Toots Zynsky's work in a book about American glass artists in the summer of 1999. 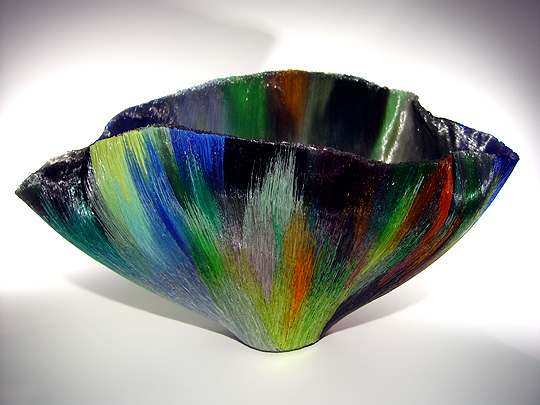 I was immediately fascinated by her work... bowls made of glass fibres that look like silk, but are actually solid glass. I did some research on the Internet, and was able to find one art gallery, Elliott Brown Gallery, that carried Zynsky's work. I contacted the gallery's owner, Kate Elliott, and arranged to pay a visit to her gallery when I went to Seattle in September 1999. Earlier in 1999, Kate had hosted a show of Zynsky's works in her gallery. This work was among several sold during the show (actually, they all sold! ); however, the collector who acquired this work had suddenly needed to sell it, and had asked Kate to do so on their behalf. That's when I came along. I told Kate that I really wanted to add a Zynsky to my collection, but that I didn't want to limit my selection to the one work she had in stock... so we arranged that I would go ahead and purchase this work, but that she would hold onto it for me until more Zynskys arrived in the gallery. Kate would send me pictures of the new works, and then I could decide which one I really wanted. So, November came around, and Kate received two new Zynskys just in time for the SOFA show in Chicago, Illinois. Kate sent me pictures of the new works, but, since I really was more familiar with this work, I decided to go ahead and acquire it. Settling Serena is one of many works in the Serena series... others in the series that I've seen are Ballare Serena ("Dance of Serena"), Bellavista Serena ("View of Serena"), I Racconti Serena ("Story of Serena"), Cantare Serena ("Song of Serena"), Poco Serena ("Little Serena"), Burning Bush Serena, Keta Serena, Lido Serena, and Scarlet Serena. Using a flat, round container, she begins laying out the threads, generally through the center of the container. Because the bottommost layer of threads form the outer layer of the finished work, she has to work in reverse (the outer layer is laid down first). There are about eight layers of threads in this particular work. Once all of the threads are in place, the container and threads are placed in an oven whose temperature is hot enough to melt the threads and fuse them together into a single mass. 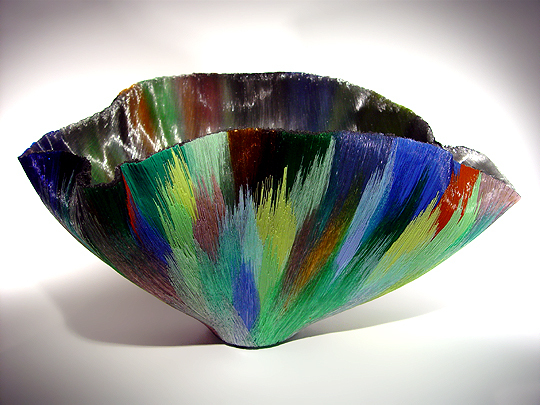 The fused glass is removed from the oven and, while it is still molten, is formed into a bowl shape using molds, implements, and gloved hands. The result is amazing... the outer layers of the work look like silk, but are actually hard to the touch. Some of the outer threads are opaque glass; others are transparent. The inner layers are made of transparent, colorless threads that almost look silver. The combined, fibreoptic effect is really cool... when lit from above or from the side, the work glows more in some places than in others. Another interesting thing to note is that different colors of glass have different melting temperatures... so, some of the colors of threads are more fused than others. For example, the orange threads are almost completely merged with each other, but the blue threads are still distinct. I really love this work... the effect of thousands of threads of glass (according to Toots, works like Settling Serena and Bisbiglio contain up to 30 kilometers of thread!) of a multitude of colors, all transmitting light in different ways, is really beautiful. Once you have seen a Zynsky, you will always recognize another one when you see it. Incredible.